Who knew that re-creating Quaker’s classic chewy granola bars could be so simple? Not me, or you better believe I would have whipped up a batch much, much sooner! No baking required, we’re talking maybe ten minutes of prep, plus a bit of chilling, before you’ll be nibbling away at these tasty, peanut-butter-chip-studded snacks. I based the recipe below on one by My Kitchen Escapades, reducing a few items that I thought were too high — sugar, salt and fat — and boosting a couple in the flavor department. I was a bit worried that reducing the amount of sugar syrup would lead to bars that just fell apart, so I borrowed a little trick that I use for making granola with nice big clumps: flaxseed meal. It adds just enough structure to the mix, preventing the bars from crumbling all while keeping them nice and chewy. I promise you won’t even taste it with all of the other peanut buttery goodness going on! What’s your favorite lunchbox snack from when you were a kid? Do you remember Kudos? Let’s talk in the comments or on Facebook or Twitter! The Trader Joe’s peanut butter chips I used contain dry milk powder, but other than that the recipe is dairy-free and vegan. Feel free to swap out the chips based on personal and dietary preferences! Line a 9″ square pan with a sheet of wax paper, make sure there’s overhang on two sides (you’ll use it to easily remove the bars later). Grease exposed sides with butter or oil; set aside. Mix together oats, puffed millet and coconut (if using) in a large, heatproof bowl (4-quart); set aside. In a small saucepan (2-quart), combine oil, agave and brown sugar. Set over high heat and bring to a boil, stirring constantly; cook until sugar is dissolved and mixture is syrupy, about 30 seconds. Remove from heat and whisk in flaxseed meal, stir until evenly distributed. Whisk in peanut butter, vanilla extract and salt, stir until smooth. Pour syrup mixture over oats (it won’t really look like enough, but it will be! ), stir with a spoon until mixture is cool enough to handle. Use super clean hands to continue to mix/knead until everything is evenly coated. Mix in peanut butter chips. Pour mixture into prepared pan and pack down to make an even layer (about 1⁄2” thick). Cover and refrigerate for about 1 hour to set. 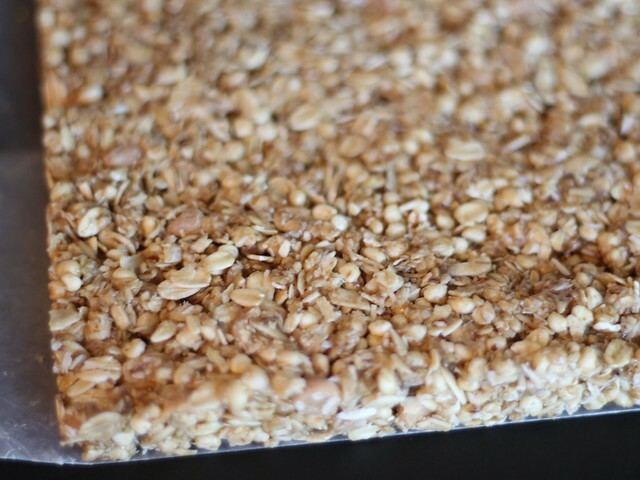 Once set, use wax paper overhang to lift granola bar block out of the pan. Cut into 12 bars (about 1 1⁄2” x 4 1⁄2” each). 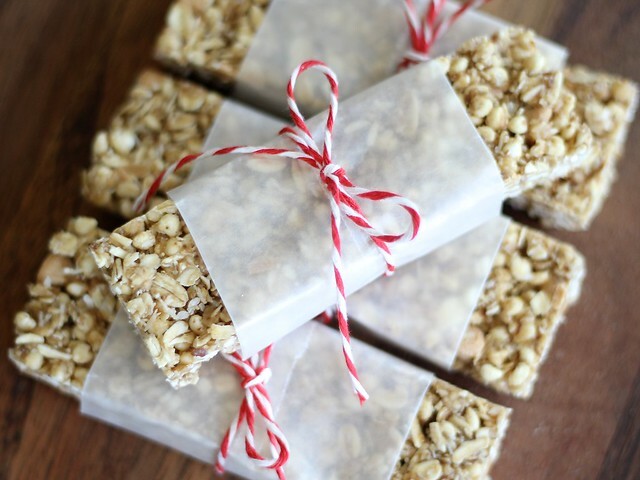 Wrap each bar in wax paper or plastic wrap, and transfer to a storage bag or airtight container. Store in fridge or freezer, allowing bars to come to room temperature before enjoying! ¹ You can find puffed millet at Whole Foods or other natural foods stores. Arrowhead Mills and Nature’s Path are two brands you’ll often run across. Can’t find it? Feel free to swap in puffed rice cereal or gluten-free Rice Krispies. ² I used Trader Joe’s brand peanut butter chips. Leftover chips are great in classic oatmeal cookies! These look delicious. I am going to try these with just peanuts instead of peanut butter chips. Thanks.